Game Bird Wings Variety Pack. $10.99. "Exactly what I needed for our 10-week old puppy!" Quick delivery and a great product. Exactly what I needed for our 10-week old puppy! Thanks! "I am using it to train my Brittany, and he loves them. I highly recommend this product!" This variety pack is great. I am using it to train my Brittany, and he loves them. I highly recommend this product! "Arrived clean and well packaged. They are easy to zip-tie onto a dummy, and the dogs love the feel of feathers in their training. " I was not sure which wings would best fit our retrieving dummies. 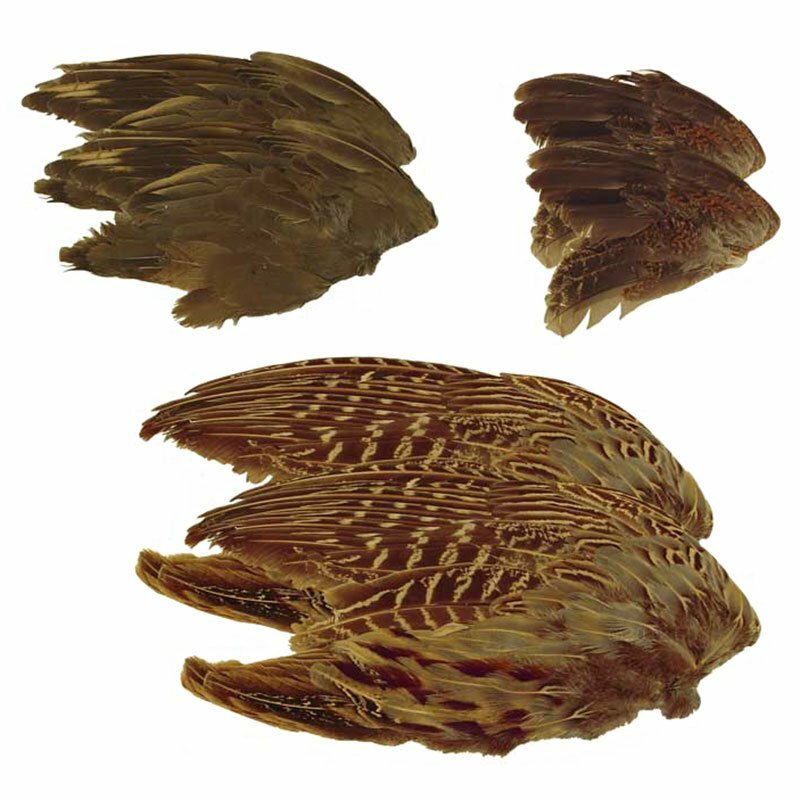 Since we have several sizes and thicknesses of dummies, the Game Bird Wings Variety Pack was a perfect solution. They arrived clean and well packaged. They are easy to zip-tie onto a dummy, and the dogs love the feel of feathers in their training. Excellent customer service!! As with everything we have ordered from Gun Dog Supply, they were well packed, and arrived quickly. English Lab. Hunts. Family pet. This package was great! We used the wings to help pick out our puppy to indicate the one with the best hunting instincts. Came very quickly and was great! Awesome company! "Great order!! Will certainly be back!" Great order!! Will certainly be back! "Great product and super fast shipping." "Very nice product at a fair price." Very nice product at a fair price. "I think it would have been better to have had the different bird wings packaged separately within the pack." Shipped out promptly. Product was sealed all together. I think it would have been better to have had the different bird wings packaged separately within the pack. However my pup pointed the wings right out of the pack. "The wings arrived in excellent shape, and my young pup was eager to play with them!" The wings arrived in excellent shape, and my young pup was eager to play with them! "Would like more information on best ways to use." Would like more information on best ways to use. "Extremely helpful in getting the pup used to the feel of feathers!" Extremely helpful in getting the pup used to the feel of feathers! She loves it and gets excited when it comes out for a training session. "His eyes light up when I get them out for him to retrieve." The game bird wings are a perfect way for me to start my dog out to get his drive going for Prey. His eyes light up when I get them out for him to retrieve. But he doesn't want to bring them back to me, so I only use them for a few retrieves a day. When I put the wings away my pup runs all over the house looking for them. "My lab went crazy over the feathers." My lab went crazy over the feathers. I had to put them in the garage so she would not get the scent. These wings are great for puppies and great for adding to bumpers. Exactly what I was looking for. Fast and great service! Ordered Friday afternoon, received on Monday! Thanks so much! I love them and they definitely have my pup's attention. "These are a really nice addition to my dog training bag." These are a really nice addition to my dog training bag. My dog that I am training with these loves them and gets the "I smell something I know I should chase" look in her eyes. My other dog (a collie) won't leave them alone. I was surprised at how my dogs reacted. "The wings instantly attracted his attention." German Wirehaired Pointer. Family pet. We have an 11 week old puppy who we're beginning to train. The wings instantly attracted his attention. "Opened up the bag and my 13 week old pup who had never seen a bird before instantly went birdy." Opened up the bag and my 13 week old pup who had never seen a bird before instantly went birdy. If there's an option between looking for a wing or chasing a ball, you'd think the ball never existed. She is absolutely captivated with the wings. "My gsp loves them, and they are working great." This is just what I was looking for. My gsp loves them, and they are working great. "Easily attaches to fishing pole or bumper for training." Shipped fast. Dog goes crazy over the wings. Easily attaches to fishing pole or bumper for training. Great product. Best value around. These wings are great! They were well packaged, and the feathers do not fall out like other wings I have bought in the past from other suppliers! They are not extremely dried out, and I have found out that it is best to store the unused wings in the freezer! It's a trick I learned from a taxidermist! "My dog took them in her mouth immediately." My dog took them in her mouth immediately. I hope to get to on a bird soon. Very nice wings. Molly, our Brittany puppy, is really enjoying the training sessions! A very quick, easy transaction. My dog loves them. He's not big on chasing bumpers, and only gets excited about the dokken dummy if it's in the water, but these wings really get him going. Even though he's just a pup, he sniffs, searches, and generally hunts these up with gusto! Great product. Works very well with all ages of dogs. Milo loves them, and they work perfectly with a cheap fishing rod out in the yard! "Nice little packet of wings." Nice little packet of wings. I have no complaints. The dog truly enjoys them, and they're very useful when training the bird to scent hunt. I wish they had larger wings from ducks and geese, though. Good quality. Unfortunately, at this point my dog loves to smell them in the dummies, but only wants the real thing. "My dog went wild as soon as she caught the scent." These wings arrived in great shape, and my dog went wild as soon as she caught the scent. The only downside is that the smaller wings are a little fragile and only lasted through a few pointing sessions. The pheasant wings are definitely more durable. But it's a great product and would definitely recommend for the serious hunter. "Wings of different feathers should be separated within the packaging, rather than bulk pack together"
Wings of different feathers should be separated within the packaging, rather than bulk pack together and most likely stored together for an extended period of time. Thus what scent is left after freeze drying becomes somewhat homogeneous smell of a 'Chukquailant'. "When training a Pointing lab, there are few applications for a bird wing. Save your money and get live birds when the time comes." When training a Pointing lab, there are few applications for a bird wing. Save your money and get live birds when the time comes. Includes 2 Chukar Wings, 2 Pheasant Wings, and 2 Quail Wings.